The presiding judge of Nnamdi Kanu’case, Justice Binta Nyako has on Tuesday the 13th of December 2016, stated in Court 4 of Federal High Court Abuja that "This Court Is Mine And I Will Use It The Way I Want". This statement was made during a court sitting, when the defending counsel of IPOB Leader Citizen Nnamdi Kanu, countered her ruling on Secret Trial where the witnesses will be masked and as well hidden behind the screen, keeping the press, defendants and everyone out of the trial. There is no place in the World, where a court of jurisprudence, is owned by anyone. If a Court where people run to seek for justice is owned by a Judges it then means justice has been raped and murdered. That court should be scrapped off and must not exist. There is no way, such court can grant justice to the innocent,hence it should be sent to oblivion. Citizen Nnamdi Kanu and other defendants must not be trialed in a court where the presiding judge does whatever she wants as she boldly stated in the court. A court ruling must be done based on the law guiding that country and it is known all over the World that, Nigeria practices Common Law and as such, secret trial is against the rule of law in Nigeria. If Justice Binta Nyako insist on doing whatever she wish to in Federal High Court, her legal certificate should be nullified, her gown burnt for insulting mother justice and she must not be allowed to preside over Citizen Nnamdi Kanu's case. 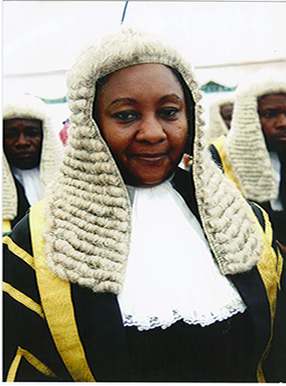 The court sittings presided by Justice Binta Nyako who was appointed by her Brother the President of Nigeria Muhammadu Buhari,exposed her unprofessional Anti-Legal attitude, as she repeatedly verbally attacked the defending counsels of citizen Nnamdi Kanu and four other defendants. On the 17th of November when she denied granting the defendants bail, she verbally attacked the defending counsels by asking them to "Sit Down”, whenever they legally argued on a motion appropriately filed in the application. Her verbal hostility proves that she is following the orders of Muhammadu Buhari the self acclaimed judge who convicted Citizen Nnamdi Kanu through his Presidential media chart. Binta Nyako must not trial Citizen Nnamdi Kanu secretly in a court she tags “My Court". The World must not keep mute over the public violation of Citizen Nnamdi Kanu's human right. Justice Binta must not be allowed to destroy the lives of innocent citizens who only exercised their human right, in her personal court. The Leader of The Indigenous People Of Biafra and the entirety of IPOB are saying No to secret trial and must not be trialed in the personal court of Justice Binta Nyako. Basically, the shameless Binta Nyako has turned the court into her personal family feuding merit-less court that her brother Mohammadu Buhari bought with corrupt money to save her criminal husband from spending time in jail for embezzlement. Binta Nyako and her criminal husband, and Mohammadu Buahri, and John Tosho are bunch of lunatic hoodlums who should spend the rest of their lives in jail. She is not fit to even be a practicing judge to sit in any court. She is embarrassment and should be immediately removed. Her face should be spat on!!! Am not surprise that, that idiotic and brainless judge called Binta Nyako will act that way as she must do the work him that sent her, but the issue here is that such trial must not be allowed to hold in a country were we practice common law, why must he be tried in the secret, that means that the government headed by lunatic president is totally aware of what Nnamdi Kanu is agitating for and would want to use judiciary to intimidate him...Buhari and Binta should be made to face trial for violating Nnamdi Kanu's human right.